Coconut Flakes cereal. Its claim to fame is that it is the ONLY Paleo cereal on the market. 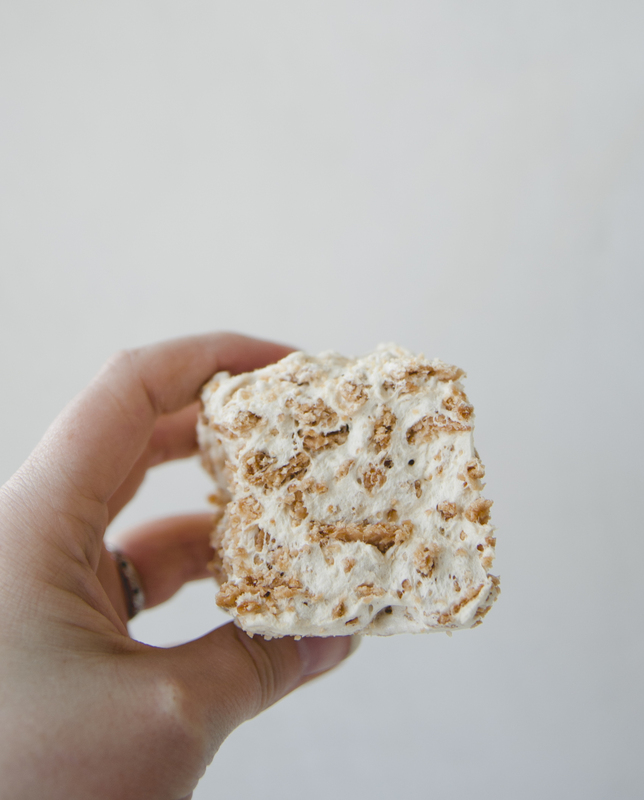 My husband Nick is super into this cereal, and one day I was like, ‘Why not turn it into ‘rice’ crispy treats?? 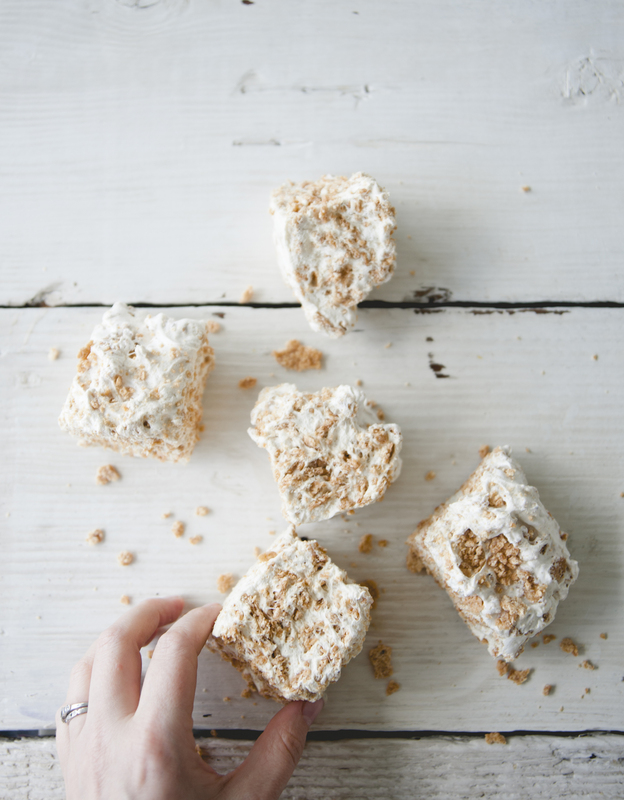 I used our favorite marshmallow recipe, and created this delightful alternative to the rice crispy treat. 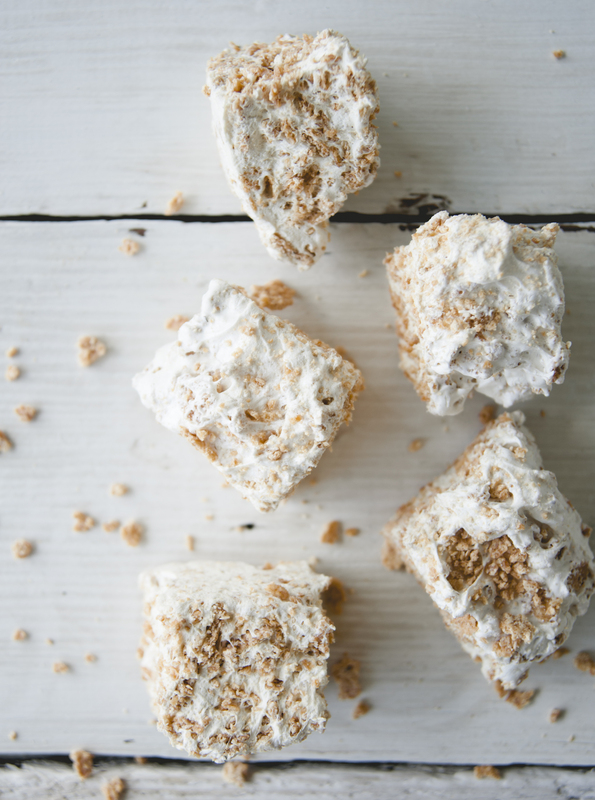 Paleo people get ready, your dessert game is about to change in a real good way! Enjoy! In a saucepan, combine remaining 1/2 cup water, raw honey, and vanilla. Turn on stove to medium heat, and bring the mixture to a simmer until it reaches the soft ball stage at 240 degrees. Turn mixer on, blending the gelatin and water mixture. Slowly begin mixing in syrup mixture and continue to beat for about 10 minutes. Beat until marshmallow peaks form. Stir in coconut flakes. Pour mixture into prepared pan and allow to set for about 4 hours. 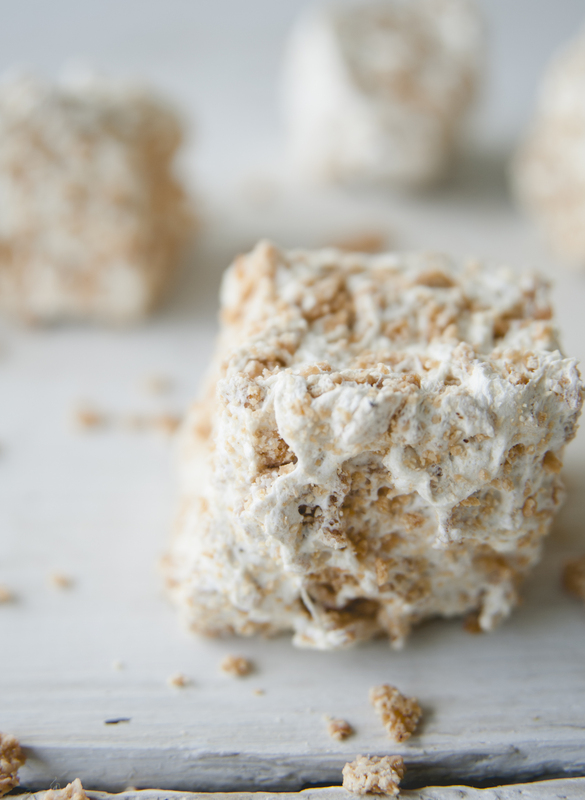 This entry was posted in baking, dessert, snacks, summer, Uncategorized and tagged coconut, coconut cereal, coconut flakes, coconut rice crispy treats, dairy free, dairyfree, easy, gluten free, grainfree, grass fed gelatin, grass fed gelatin powder, paleo, raw, refined sugar free, rice crispy treats, sweet laurel, sweet laurel vanilla extract, sweetlaurelbakery, vegan on August 19, 2016 by sweetlaurel. Do you really put pumpkin pie spice in this? I see it in your recipe instructions, but not in your ingredient list. Also, would this be moldable sort of like you can mold real rice krispie treats into shapes for cake making? Wendy, the pumpkin pie spice wass a typo. Thanks for catching that! I just edited the recipe. Can’t wait to try these! 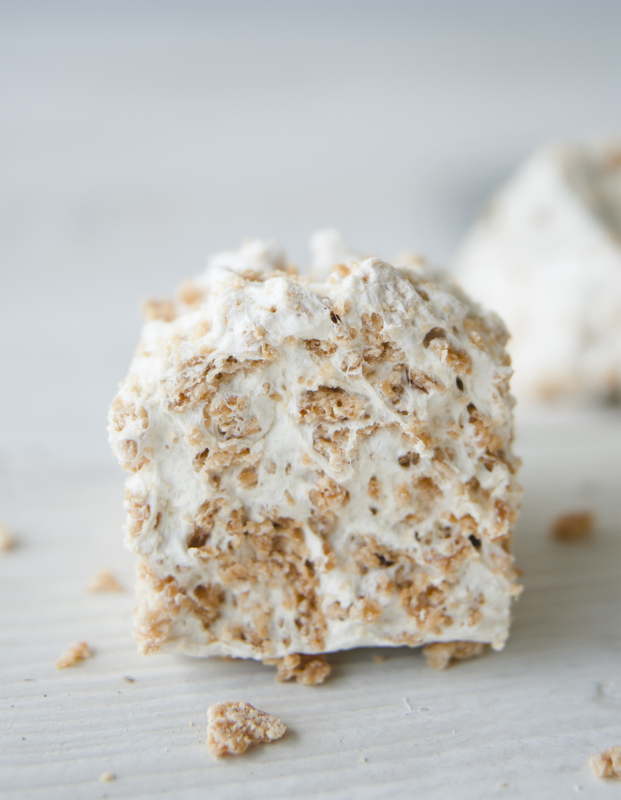 Have been searching for a paleo replacement for rice krispie treats! Thanks for posting this! I have been unable to find the Paleo Flakes anymore. Have you found a replacement? I have used these organic corn flakes sweetened with fruit juice before: http://shop.naturespath.com/Fruit-Juice-Sweetened-Corn-Flakes–ECO-PAC/p/NPA-600565&c=NaturesPath@ColdCereals. My husband loves this cereal! These look so amazing! I think I must have done something wrong! Ours went soggy! 🙁 do you know what we may have done and how we cab fix it? I love this recipe!! !